It is an exciting day as we booked our wedding venue, and with some crazy luck, we won the lucky draw TWICE! 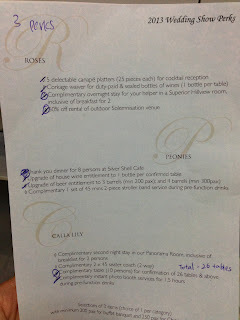 For $28 (per couple), we attended Shangri-La Sentosa wedding show. This is the first time we attend a wedding show, and we went there not expecting much. She even thought we can reach there late, as there can’t be so much to do from 11.30am-5.30pm. She was wrong. And luckily I insisted to go punctually. Be prepared to bargain for perks! Of course, I only speak for Shangri-La Sentosa wedding show, organized by Style:Wedding. 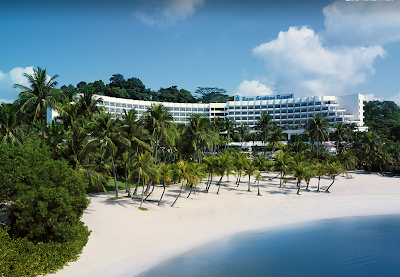 The first time I went to Shangri-La Rasa Sentosa is during a 24-hour hackathon. I fell in love with the place during the hackathon, as the hotel building itself is very beautiful, and it faces the sea, with a good beach. What’s more, during the night, I witnessed their outdoor wedding dinner on their sandy beach. I wished my wedding to be (almost) that way. During the wedding show, you get to choose 3 perks, 1 from each category. But, they are flexible, and will let you choose 3 from any categories. And with some negotiation, they offered us any 3 perks, plus the 1 complimentary table perk. That’s the most we could get.. This is the first time I am so lucky for a lucky draw. Before they start the draw, they said each person (they meant each couple) can only get 1 prize. So if you win the $130 prize, you cannot get the $3000 prize later. However small that chance may be, they called out same names, for 3 person that day! And it happened for us too. Though fortunately, we accidentally wrote different names on our chance cards. They called her name, in which she won a $130 fengshui voucher. Then they called my name, in which I won a 2 night stay at a Panorama room! But after I took photograph on stage, came down, the person-in-charge explained we are not suppose to win again. And we can’t exchange for the higher priced room stay.. They gave in to our disappointment, and hence gave us another perk where we can stay 1 additional night in a Panorama room! A discount from 2 nights to 1, but already lucky! They should let a couple choose which prize to keep, then return the other prize back to draw again. Who would complain, when a person is so lucky and get drawn twice?